Ogyu MFG has been distributed manu machines. Diamond wire saw, Polishing machine, Circular Blade saw etc. in 16 coutries over the world. And Ogyu MFG has been distributed diamond tools, diamond wire, diamond wheel, diamond bit, diamond circularand Ogyu MFG in only one company, which is manufacturing stone processing machines and diamond tools in theworld. Diamond wire is one of our main product. Our diamond beads ( segment ) bonded with tungsten curvide (WC) has exremely hardness and durability, which is the most advantage in quality. 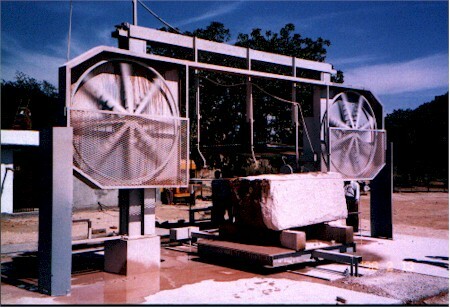 We manufacture variety of wires for stone type and cutting purpose. We believe our diamond wire is the best in the world especially for hard stone such as a granite. We started to manufacture the diamond wire saw in 1987, which was a pioneer in the world. We have various diamond wire saw. We can make the best machine for customer's any kind of purpose. We introduse a lot of diamond wire saw with picture in product introduction page. Please open and enjoy it. Fully automatic optical tracing system ( resistered Japan & US Patent) . This is a curb cutting device, which doesn't need any computer programing . You need only a paper template. Operation is very easy. The movement of optical sensor which trace a paper template and the machine are synchronized to cut a curved shape as per a paper template. You can easily fabricate any kind of shape stone.